"Hollywood Witch Trials" is a series of portraits based on celebrity crime mug shots and excerpts from Salem Witch Trial transcripts. About 72 people were accused and tried of witchcraft during the Salem Witch Trials. My own grandmother from about 13 generations back, Mary Eastey, was among the last people executed for witchcraft in Salem, Massachusetts. 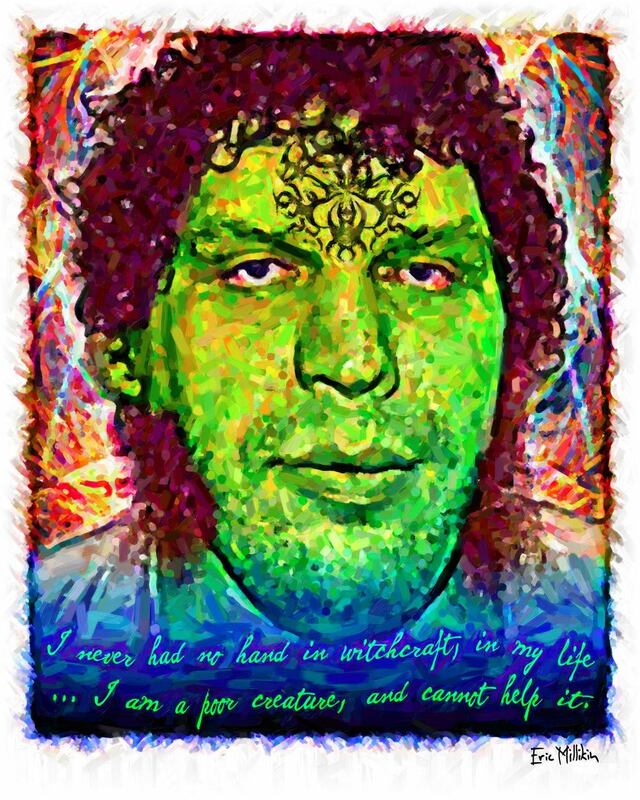 "Hollywood Witch Trial: Andre the Giant"
This portrait of Andre the Giant is based on his mug shot after he was arrested for putting a TV cameraman in a headlock in Iowa in August 1989. The quote here is from Giles Corey, who was pressed to death under heavy stones in an attempt to get him to enter a plea after being accused of witchcraft. He died after two days of torture 323 years ago on Sept. 19, 1692. His wife, Martha Corey was executed by hanging Sept. 22, 1692. "Hollywood Witch Trial: Lindsay Lohan from Windsor"
This portrait of Lindsay Lohan is based on her LA County Sheriff's Department mug shot from October 2011 after a judge revoked her probation because she failed to perform court-ordered community service. 369 years ago, Alse Young (ca. 1600 – May 26, 1647) of Windsor, Connecticut was hanged in the first recorded instance of execution for witchcraft in America. The quote, "One of Windsor was hanged," is taken from a journal of then Massachusetts Governor John Winthrop. "Hollywood Witch Trial: Paris Hilton"
This portrait of Paris Hilton is based on her mug shot after she was arrested for a parole violation in 2007. The quote here is from Martha Corey, who was executed for witchcraft about 323 years ago on Sept. 22, 1692. 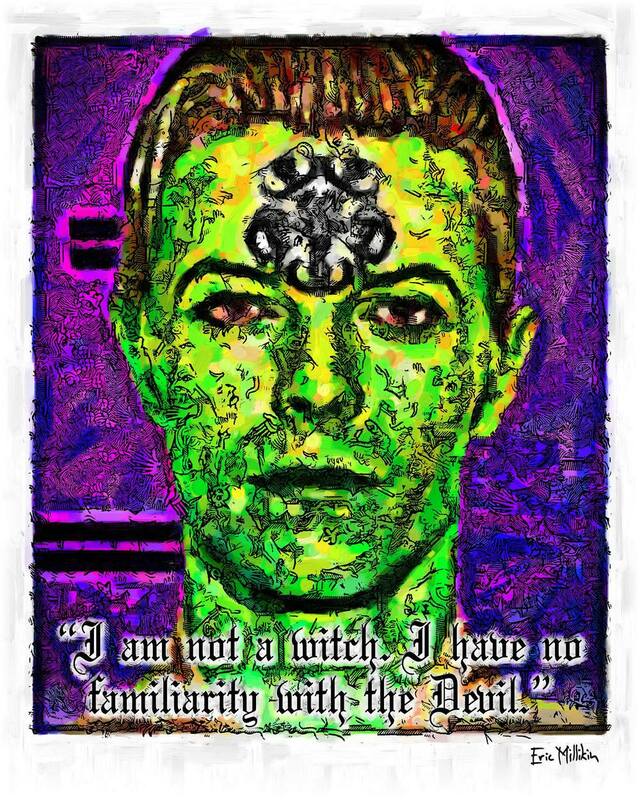 "Hollywood Witch Trial: David Bowie the Witch"
This portrait of David Bowie is based on his March 1976 mugshot after he was arrested along with Iggy Pop in upstate New York on a felony pot possession charge. Quote here is from Bridget Bishop, who 324 years ago (June 10, 1692) was the first person executed for witchcraft during the Salem Witch Trials. This portrait of Eminem is based on his mug shot after he was arrested in June 2000 for carrying a concealed weapon and for assault after he got into a fight with a man he saw kissing his wife. The quote here is from James Willard, who was accused of witchcraft after refusing to arrest others who had been accused. He was hanged on August 19, 1692. "Hollywood Witch Trial: Kid Rock"
This portrait of Kid Rock is based on his mugshot after he was arrested for getting into a fight at a Waffle House in Georgia in Oct. 2007. The quote here is from Giles Corey, who was pressed to death under heavy stones after he refused to plead (guilty or not guilty) after being accused of witchcraft. He died after two days of torture 323 years ago on Sept. 19, 1692. His wife, Martha Corey was executed by hanging Sept. 22, 1692. "Hollywood Witch Trial: Lindsay Lohan"
This portrait of Lindsay Lohan is based on her mug shot after pleading no contest to reckless driving in March 2013. Quote here is from my great grandmother about 13 generations or so back, Mary Eastey, who was executed for witchcraft 323 years ago Sept. 22, 1692. "Hollywood Witch Trial: Bill Cosby"
This portrait of Bill Cosby is based on his 2015 mug shot when he was charged with drugging and sexually assaulting a woman 12 years earlier. He is 78 years old. The quote here is from George Jacobs, Sr., who was found guilty of witchcraft and hanged on August 19, 1692. He was 72 years old. His granddaughter was also accused of witchcraft, and was one of his accusers. 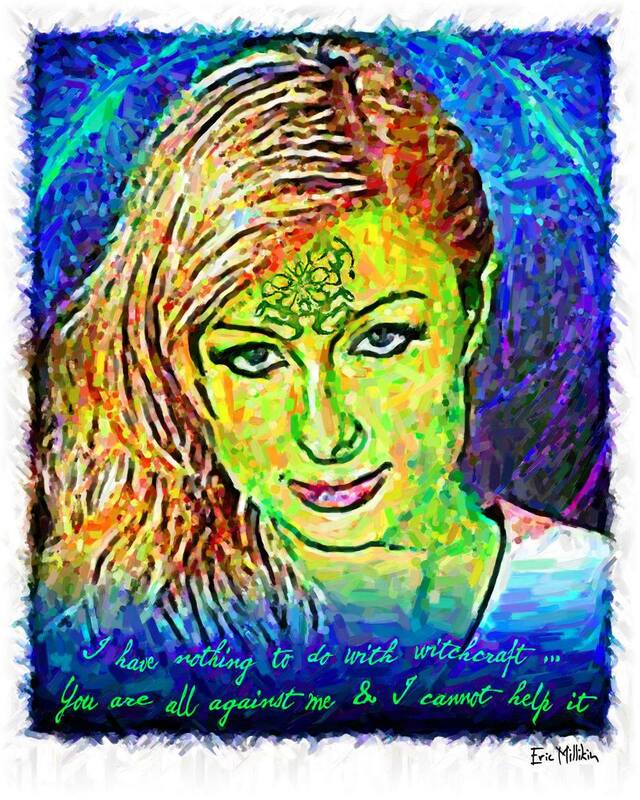 "Hollywood Witch Trial: Paris Hilton the Devil"
This portrait of Paris Hilton is based on her 2010 mugshot when she was arrested for cocaine possession. Quote here is from Rebecca Nurse, my great aunt from about 13 generations back, who was executed for witchcraft in Salem on July 19, 1692. May 26, 2016 by .